Black bridesmaid dresses are becoming an increasing popular choice for brides. 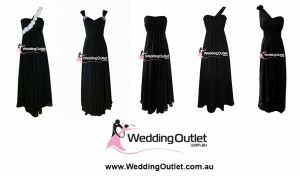 Black against the white dress allows the bride to stand out against her bridesmaids. Black is also a slimming colour so for bridesmaids that have concerns about their figure, black is a great colour to look slimmer. If you want the dress made in black, simply choose ‘black’ when picking the colour.